Providing you the best range of hydraulic bollards with effective & timely delivery. With the firm commitment to quality, we are offering our esteemed patrons with Automatic Rising Hydraulic Bollards. 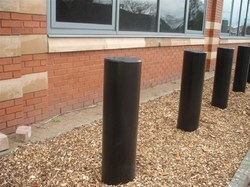 A heavy hot-dip galvanized finish ensures that the bollards will last a lifetime without being destroyed by corrosion. Bollards are equipped with top sensitive plate to protect accidents. Easily installed along with hydraulic drive unit, these bollards are user-friendly control panels. Looking for Hydraulic Bollards ?